Hey everyone! This month the Blog Hop with Hearts are sharing projects with a Workin' Hard or Hardly Workin' theme! 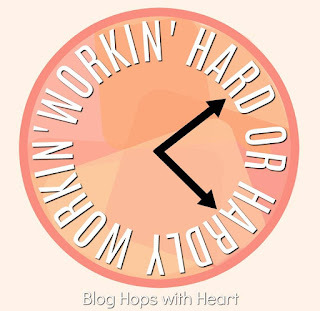 If you came from Kelly's fabulous blog, you are in the right place. For some my card may seem to fall in the Workin' Hard catagory. For me, watercoloring is so relaxing...it almost feels like therapy. So, I don't consider it work at all! To make my card first I stamped out Altenew Modern Deer with Memento Desert Sand ink. 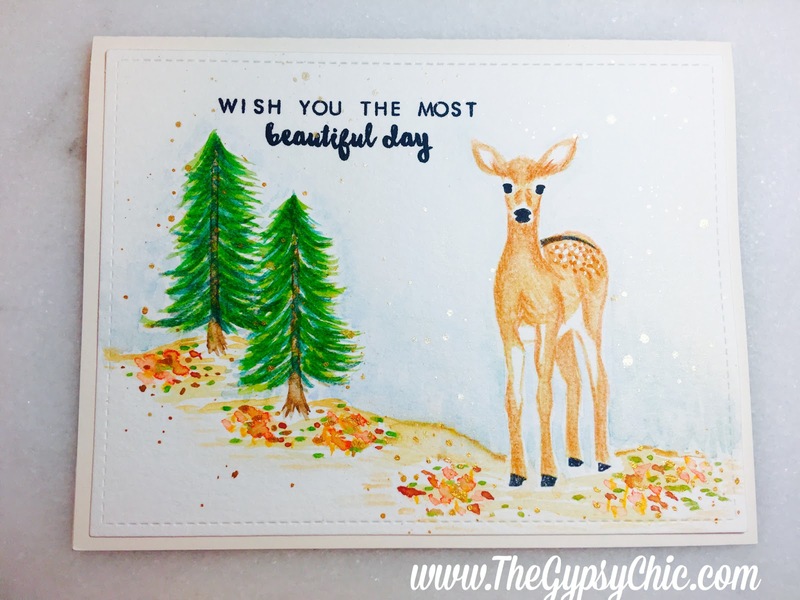 Then I watercolored the deer using the No-Line coloring technique with my Daniel Smith watercolors to paint my card. Then I stamped the Altenew Pine Tree the same way, just to give me a suggestion of where to watercolor. My trick to getting perfect splatters is to use scrap pieces of acetate to cover up where ever I don't want splatters, then I can see right where my splatters go. I used my all time favorite Finetec Pearlcolors Gold to add the splatters. Then, I stamped out the sentiment from the Altenew Beautiful Day stamp set with Versafine Pigment ink. Lastly, I added a suggestion of a hillside and some fall leaves just by loosely adding bits of fall colors. Now hop on over to see the beautiful creation Becca has for you! Thanks so much for joining me! Beautiful card (as always!!) Loved your trick for getting the perfect splatters. I usually just leave mine up to fate, but that hasn't always worked in my favor! HA! This is lovely! I think watercolors make one layer cards look like little works of art. Thanks for sharing.